Matthew Paris (c. 1200-1259) became a monk of St. Albans in 1217, and in 1236 became the abbey chronicler, a task which allowed him to exercise and explore his talents as a scribe, and as an accomplished and inventive artist. 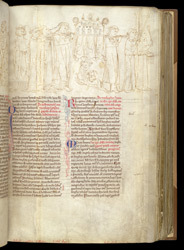 Most of this manuscript is written in Matthew's own distinctive handwriting, as are the miniatures, except for some added in the 14th century. The 'Lives of the Offas' concerns two Kings, both called Offa, the first of whom had promised to found a monastery in the 5th century, and the second of whom carried this out when St. Alban's relics were discovered in the 8th century. Having discovered the relics of St. Alban, King Offa housed them in a new shrine and had them carried in procession. Below the shrine in this drawing can be seen cripples, hoping to be curing by touching the shrine.